Continuing the APE Music podcast this week is Metro Boy, one half of Ben and Lex, whose radio shows, dj sets and remixes for ape have been going down a storm. So get locked for 1 hours of soundscape techno to get you through these winter nights. This podcast is taken from the APE Music Radio show on Realinstant which will be bringing the APE Music family together to showcase there skills in a bi-monthly 1 hour mix. Along side label owners Ben and Lex there will be mixes and artist showcases from That Girl DJ, Mobius, Afghan Headpsin, Benjamin Vial, Freerange DJs, Enough Weapons, Metro Boy and Mskr-nt. APE Music Radio will not be confined to one style of breaks (or even genres) but will encompass everything from funky to techy to tearout and out the other side including techno, wonk, house, even Dubstep and Drum and Bass. Been working on a remix for Temper D's 'Wonkey Glasses' which will be coming out on Standard Audio soon. Now I've made 2 versions, both very similar but ones a bit more rave then the other haha. Dunno which one ill send to the label for releases... Think I'll play them out a bit more and see which goes down best. Anyways ignore the mix down as there mad rough, Lexy is doing me proper versions this weekend. Hurrah for Techno :) 2 hours of the usual bleeps and deep techno vibes for you all this week. You can catch me playing at This Is Techno on the 5th September @ Plug 'n' Play Studios, Reading. Click for full details. Quick lil video I have done for my remix of Smacs and Patrick Kong's 'Paraffin' forthcoming on the VIM Records label. Super hot show this week for you all to listen to.. the first hour is crammed with bleepy techno and then the awesome Djuma Soundsystem take over the second hour. Thats right all. This tuesday on Brap.fm I have the pleasure of airing a sweet mix from Djuma Soundsytem. Mega late on the archive for this one and I've lost the original radio broadcast... bugger. But its ok as I have the Ableton live recording so for this month you can have 2 hours of pure uninterrupted music. Connection problems galore plagued my first set for The Drome on Second Life last night, so for every one who patiently sat and waited while I sorted stuff out here is the totally un-interrupted archive for you to enjoy. You can catch me from 9-11pm (gmt)at the The Drome venue. All the details you need can be found on Fresh Static and hopefully I'll see you on there. Fresh Static takes its name from a line of poetry: "My body tingling with fresh static all my own" .. Okay so the poem has more to do with someone turning into an android to be with a cybernetic lover, but tingling with fresh static is exactly how great electronic music should make you feel! So this is what we are trying to get out there .. Great electronic music - Fresh static for you! Second Life opens up fresh opportunities for electronic music to spread and grow, so we're also publishing features on this website about the scene in Second Life - The DJs and producers, the clubs, new builds, parties. We want a crossover, so we have the parties where real world DJs play in Second Life alongside DJs from the virtual scene, while also writing about the electronic music scene in Second Life for the real world to read about. Summery-ish vibes this week for the show, the usually deep bleepy minimal with sprinkles of deep house and tech jazz to brighten it all up. Plus super exclusive drops of two new remixes I'm working on for APE and VIM Records. This one is a fundraiser for Phonic FM to get a new mixer so will be £1 entry (ouch! ;o)) so come on down and help keep us djs on the airwaves. Fresh new tunage on this weeks Metro Boy show on Brap.fm. All loopy and bleepy just the way we like it. 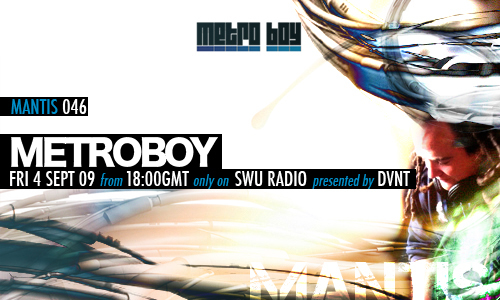 The Podcast this month comes from Metro Boy, the Minimal Techno DJ/Producer hailing from Devon. This 45 minute mix is but a taste of the looped up bleepy techno that Metro Boy has been supplying the Brap.fm listeners every other Tuesday from 6pm - 8pm.